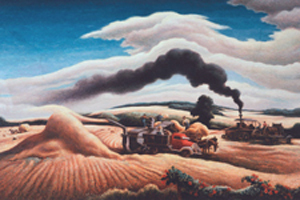 Sometimes, as in the 1938 painting “Threshing Wheat” (left), the the farm machinery seems to co-exist peacefully with the farmers and horses, merely making agriculture more progressive and productive. Still the horses seem to bow in acquiesence, and the steam from the tractor and combine, though it flows in perfect unison with the clouds, is black. It comes between the blue and white of the natural sky, threatening to cut the land off from its source of rain and sun. 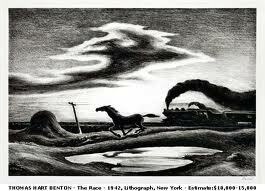 Another Benton painting, “The Race” (left), preceded “The Wreck…” by a year and portrays a horse running just ahead of the train fated to overtake him. The video below features Shannon Bonifas, one of my brilliant and beautiful daughters-in-law. An expert on modern art, Shannon was then working at Clars, the art auction gallery in California’s Oakland-Berkeley area, and a Clars’ event was part of public tv KQED’s fundraising efforts. Here she brings in and explains this painting more fully. Many say the next 25 years will see technological change coming faster than the preceding 200 years, something hard to imagine. Saying anything about what’s to come—computer screens in our glasses, even computer chips in our skulls—will virtually be old hat the next month…or hour. Yet as obesity rates skyrocket and we hear of more and more parents realizing it might be good for their kids to just go out and play, we might be able to trace the beginnings of these dilemmas to the time when the Age of the Machine—in our time not a train but a supposedly “smart machine,” the computer—collided with the age of natural muscle. 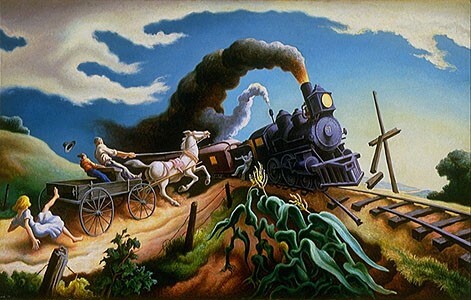 This entry was posted in Arts, Reviews & Commentary and tagged art and technology, Clars Auction Gallery, Holland Carter, Shannon Bonifas, The Race, The Wreck of the Ole '97, Thomas Hart Benton, Threshing. Bookmark the permalink.